I'm sure we would all love to have our own fairy godmother who could wave her magic wand and ‘tada’ you have a completely new head to toe outfit for every FOTF event you want to enter. Given that this is pretty unlikely, with some smart planning and creative know how you can reuse items already worn to come up with a new FOTF outfit. I decided that I wanted to wear it again for a major race day in Canberra. But it didn't quite match my outfit, so I contacted Sophie Allport and she was able to make an extra rose vine in the colour I needed. Given that it attaches with a clip, it can also be worn as a brooch, attached to a bag or even a completely different headpiece. Millinery reworn like a pro!!! There is nothing wrong with some cheap and cheerful wardrobe staples! My lovely bright pink big hoop hustle earrings from Best Dressed Accessories have also been worn a couple of times and have complimented my outfits beautifully. Along with the cartoon clutch, also from Best Dressed Accessories, which I'm finding pretty much goes with anything, has also had repeat outings. Recently I attended the Royal Randwick derby day - strictly black and white. I decided to re wear an outfit but with the white blouse from Best Dressed Accessories that I had previously worn. It’s always tricky to dress for autumn at this time of year! 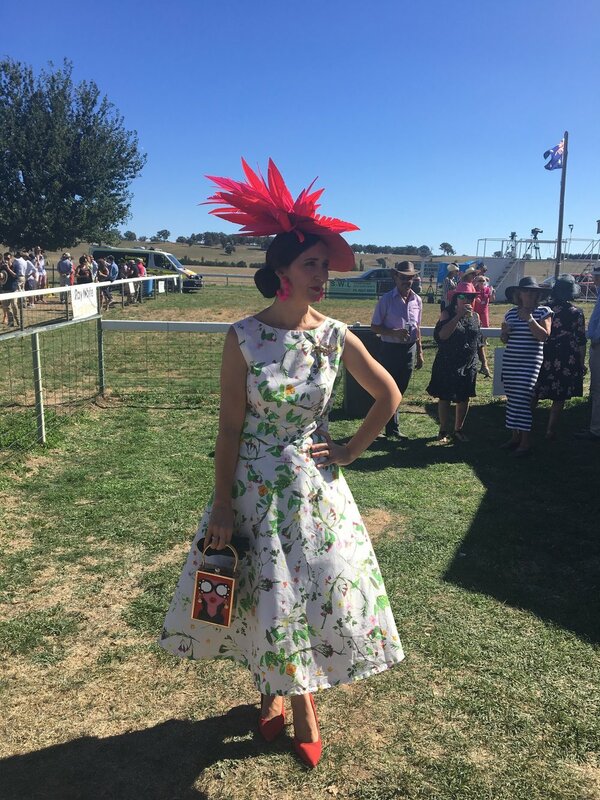 By adding a leather headpiece, long leather gloves and closed toe shoes, I have created a suitable FOTF outfit for their autumn racing carnival. Pairing this with BDA black and gold midas touch earrings and BDA Royal Wings clutch from , I have re-created an outfit using items I already had in my wardrobe. How stunning is this lay out???? LOVE Love love it! If there is something in your wardrobe that you love or want to wear again, then why not! Just change it up a bit with some different accessories and get creative with the three R’s. What a absolutely phenomenal outfit!! !